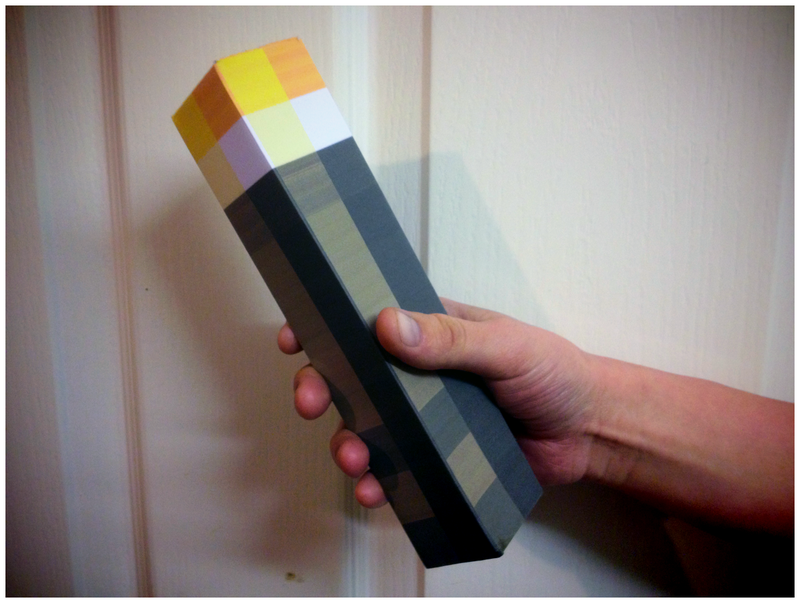 Create your own Minecraft torch model with this easy to use printable papercraft cut out, print out the A4 template to build your own life sized Minecraft torch. Right click and save image as, print out the Minecraft torch papercraft template, its a good idea to use card when printing, I used A4 presentation 160 gsm card. Carefully cut arround the torch. DO NOT cut off the tabs on the sides of the Minecraft torch, they are important! Fold all corners of your papercraft torch cut-out template. Tabs should always be folded inwards. 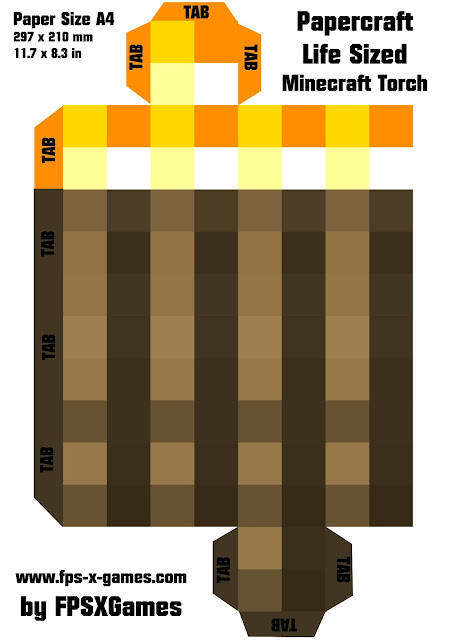 Glue or tape your Minecraft torch cut-out together using the tabs! Cool thing to make for kids partys or just use them as oversized candles for a cake (do not burn, its card!) You can even use a bit of blue tack or a pin to attach to a wall, what ever you want a life sized Minecraft torch for, just have fun and don't leave home without one. THANK YOU for posting these - my sons are THRILLED right now and cutting things out like crazy. Is there an axe? My pleasure - I'm also working on a life sized pick axe amongst other things so check back soon! thank you so much! My six year old wants a minecraft themed birthday party and you've made his dream a reality! Great templates! I even went as far to cut small star-shaped slits in the top to allow/hold flameless tea lights. Now the torches aren't only decorative but functional as well. Thank you very much. flameless tea light, great idea. I did think about making it as a working torch but could not think of anything suitable to use as a light source. I think that this torch Is awesome! Been thinking about getting one working with a real light source but not sure how to, any ideas? Thanks very much for these cut-outs. Just in time planning for my son's birthday. For the working torch, should be easy to hook up a bulb under a translucent disposable cup glued upside down to the top of the torch (to give an even 360 degree coverage. Then running wires to a 2 X 1.5V battery pack taped to the inside bottom of the torch. Of cos you'll need to cut out sections of the torch at the top so the light can be seen. Good idea guys. Ray, the disposable cup thing is just a genius idea and made me think about using a square yogurt pot. Also I think it would benefit to add a stronger card frame to support a switch & stuff. Dude, You Need To Make A Big Enderman And Sword! I Would Love That! I Love Your Stuff! Hi, the life size sword is being worked on and I'm hoping to complete soon. Also a big enderman is needed. Please link the sword, endy, and if yu make them, Shovel, hoe, and bow. All in good time. Just finishing up and should be done for the weekend. Glad to hear you all had fun making the stuff on the website. My daughter is 6 and also loves being creative. this is THE BEST WEBSITE for all the giant templates!!!!!!! Keep up the AWESOME work! Hey thanks Anonymous. What should I do next, Shovel or axe? Hey Haley, left click the template to open a new window to get the full sized A4 image. Right click and save as. Go to saved file, right click and print. If you have any printing software that came with your printer, refer to that. Awesome! Can I make this? May I ask what type of paper you recommend using for this? ie: Photo paper, heavy paper, normal paper. For the example build demonstration I did above, I used plain presentation card 160gsm (it's all I had at the time) but matt or glossy photo paper would work better, brings out the vivid colours. If you look on the Instructables you'll find that some have used this template to get a working Minecraft touch. Thanks Steve! I'm making this, but using a piece of wood as a base and then paper-crafting around it. I am then hollowing out the top of the wood and placing a headlamp inside it. I will be using yellow cellophane to make the headlamp's light more "natural". It's really cute. I think I would use them as some form of decoration, or just play with them with kids. I like the bright color at the top. It really brings to mind the brightness of a torch. I think children would enjoy making this as a family activity. There are like 101 things to do with this, some have even made it into a working touch. I for one love sitting down with my kids and getting creative. Thanks for the feedback. How About a wall mounted torch. (Have bottom end at a 45 degree angle). Yeah have thought about this before but having it connect to the wall neatly is tricky. I don't want to glue or use blue tack and the best idea I can think of is to use Velcro! Any ideas? you could use gluedots. I think command strips would work best. that way they aren't permanent but can stay put for awhile too. Ah yeah Regina good idea, it should support hmmmm I'll try it.